Short Description: This use case describes how knowledge graphs, such as KBpedia, which need to be kept current and extended based on new knowledge and new mappings, can be so maintained with acceptable effort and accuracy. Problem: Knowledge graphs are under constant change and need to be extended with specific domain information for particular domain purposes. The combinatorial aspects of adding new external schema or concepts to an existing store of concepts can be extensive. Effective means at acceptable time and cost must be found for enhancing or updating these knowledge graphs. 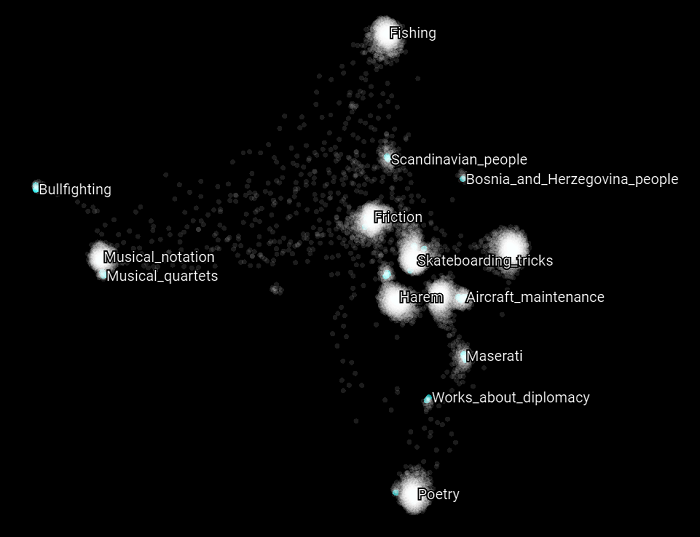 Approach: We extend KBpedia's knowledge graph under this use case by adding more concepts from the Wikipedia category structure, "cleaned" to produce its most natural classes.These extensions are made using a SVM classifier trained over graph-based embedding vectors generated using the DeepWalk method. 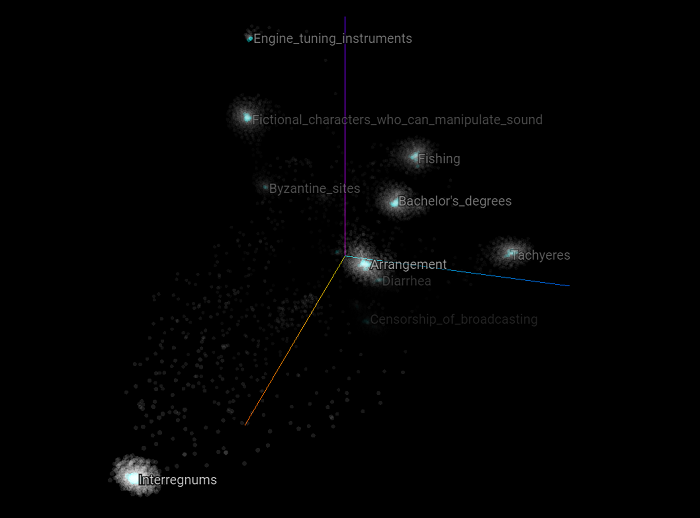 The source graph is based on the KBpedia knowledge graph structure linked to the Wikipedia categories. Means are put in place to test and optimize the parameters used in the machine learning methods. 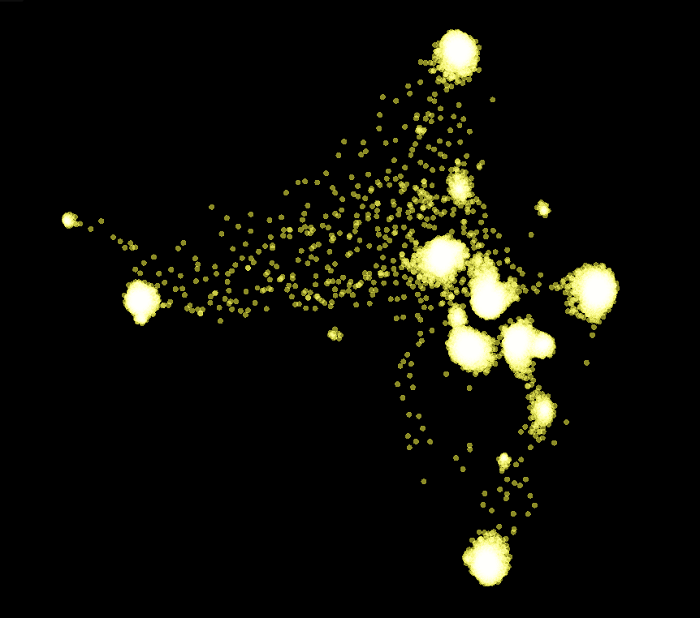 These mapping techniques are then visualized using the TensorFlow Projector web application to help build confidence that the mapping clusters are correct. The overall process is captured by a repeatable pipeline with statistical reporting, enabling rapid refinements in parameters and methods to achieve the best-performing model. Once appropriate candidate categories are generated using this optimized model, the results are then inspected by a human to make the final selection decisions. The semi-automatic methods in this use case can be applied to extending KBpedia with any external schema, ontology or vocabulary. The approach documented in this use case is applicable to extending a knowledge graph with any external schema, ontologies or vocabularies. A knowledge graph is an ever evolving structure. It needs to be extended to be able to cope with new kinds of knowledge; it needs to be fixed and improved in all kinds of different ways. It also needs to be linked to other sources of data and to other knowledge representations such as schema, ontologies and vocabularies. One of the core tasks related to knowledge graphs is to extend their scope. This idea seems simple enough, but how can we extend a general knowledge graph that has nearly 40,000 concepts with potentially multiple thousands more? How can we do this while keeping it consistent, coherent and meaningful? How can we do this without spending undue effort on such a task? These are the questions we will try to answer with the methods we cover in this use case. The methods we present herein describe how we can extend the KBpedia knowledge graph using an external source of knowledge, one which has a completely different structure than KBpedia and one which has been built completely differently with a different purpose in mind than KBpedia. In this use case, this external resource is the Wikipedia category structure. What we will show in this use case is how we may automatically select the right Wikipedia categories that could lead to new KBpedia concepts. These selections are made using a SVM classifier trained over graph embedding vectors generated by a DeepWalk model based on the KBpedia knowledge graph structure linked to the Wikipedia categories. Once appropriate candidate categories are selected using this model, the results are then inspected by a human to make the final selection decisions. This semi-automated process takes 5% of the time it would normally take to conduct this task by comparable manual means. Like other KBpedia use cases, the code examples provided herein are written in Clojure. What we want to accomplish is to extend the KBpedia knowledge graph by leveraging its own graph structure and its linkage to the external Wikipedia category structure. The goal is to find the sub-graph structure surrounding each of the existing links between these two structures and then to use that graph structure to find new Wikipedia categories that share the same kind of sub-graph structure with KBpedia, but that are not currently linked to any existing KBpedia concept. These candidates could then lead to new KBpedia concepts that are not currently existing in the structure. 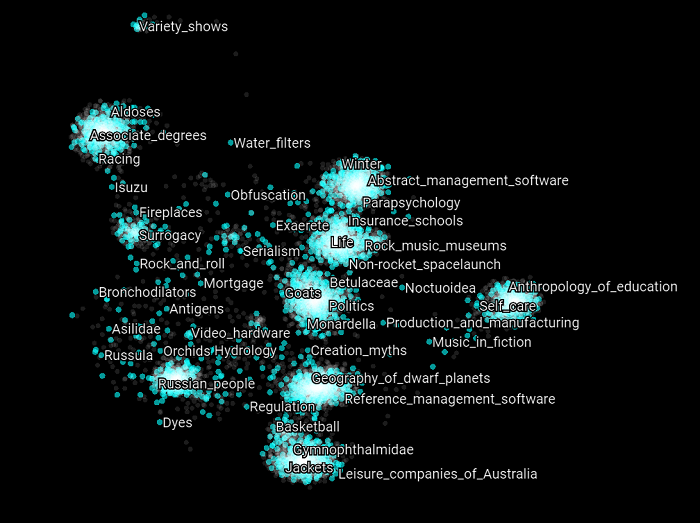 The sub-categories of Wikipedia categories that are linked to a KBpedia reference concept that is not 1. nor 2. The idea is that 1. and 2. would use the Wikipedia category structure to specialize the KBpedia conceptual structure and 3. would fix potential scope/coverage of the structure with new general concepts. The challenge we face by proceeding in this way is that our procedure potentially creates tens of thousands of new candidates. Because the Wikipedia category structure has a completely different purpose than the KBpedia knowledge graph, and because Wikipedia's creation rules are completely different than KBpedia, many candidates are inconsistent or incoherent to include in KBpedia. Most of the candidate categories need to be dropped. Reviewing hundreds of thousands of new candidates manually is not tenable without an automatic way to rank potential candidates. An objective of the process is to greatly reduce the cost of such an Herculean task by using machine learning techniques to help the human reviewer by pre-categorizing each of the proposed new sub-class-of relationships. Employ hyperparameter optimization of the previous two steps. Once these three steps are completed, we classify all of the proposed sub-categories and create a list of potential sub-class-of candidates to add into KBpedia, which is then validated by a human. These steps significantly reduce the time required to add new reference concepts using an external structure such as the Wikipedia category structure. KBpedia presently links to what we call the "clean" categories within the Wikipedia category structure. These same "clean" categories are used by this present use case. The reason for "cleaning" the Wikipedia categories is to remove internal administrative categories of use to Wikipedia alone and to remove "compound" or "artificial" categories frequently found in Wikipedia that do not conform to natural classes but are matters of grouping convenience (such as Films directed by Pedro Almodóvar or Ambassadors of the United States to Mexico). Remove other categories that were tagged to be removed that do not fall into any categories listed above. The result of this category filtering process is to produce a "clean" list of 88,691 Wikipedia categories. Note this is a significant reduction for the total category listing found on Wikipedia itself. 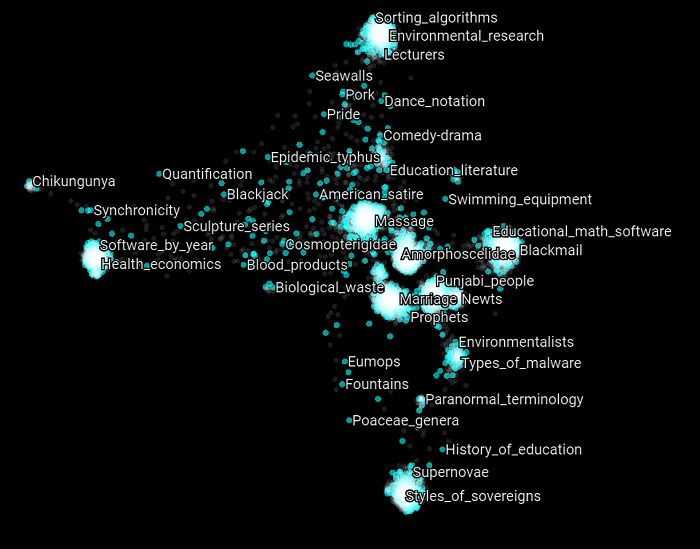 This list is also what is used as input to the our Mapper service, which is what is used as the candidate pool for possible matches between any of these clean Wikipedia categories and existing KBpedia reference concepts. Final selections, wherever made, are drawn from this "clean" candidate pool and vetted by a human prior to acceptance. DeepWalk was created to learn social representations of a graph's vectices that capture neighborhood similarity and community membership. DeepWalk generalizes neural language models to process a special language composed of a set of randomly-generated walks. With KBpedia, we want to use DeepWalk not to learn social representations but to learn the relationship (that is, the similarity) between all of the concepts existing in a knowledge graph given different kinds of relationships such as sub-class-of, super-class-of, equivalent-class or other relationships such as KBpedia's 80 aspects relationships. The sub-categories of Wikipedia categories that are linked to a KBpedia reference concept that is not 1. nor 2. (that is, core). Each of these steps will lead to a different list of candidates. "Return true is the reference concept is a leaf concept in the graph." Finally what we do is to query the Wikipedia category structure to get the list of all the sub-categories linked to each of the leaf, near-leaf and core KBpedia reference concepts. We serialize this list of candidates into three distinct CSV files. Each of these lists leads to 34,957 leaf category candidates, 6,104 near-leaf category candidates and 6,066 core category candidates for a grand total of 47,127 new KBpedia reference concept candidates to review. The next step is to create the graph embedding for each of the Wikipedia categories. What we have to do is to use the Wikipedia category structure along with the linked KBpedia knowledge graph. Then we have to generate the graph embedding for each of the Wikipedia categories that exist in the structure. To generate the graph embeddings, we use Deeplearning4j's DeepWalk implementation. The first step is to create a Deeplearning4j graph structure that is used by its DeepWalk implementation to generate the embeddings. The graph we have to create is composed of the latest version of the Wikipedia category structure along with the latest version of the KBpedia knowledge graph. The Wikipedia category structure comes from the DBpedia file 2015-10slcore-i18nslenslskoscategoriesen.ttl.bz2 and the KBpedia knowledge graph version 1.20. Finally we generate the initial Deeplearning4j graph structure composed of the Wikipedia category structure and the inferred KBpedia knowledge graph. 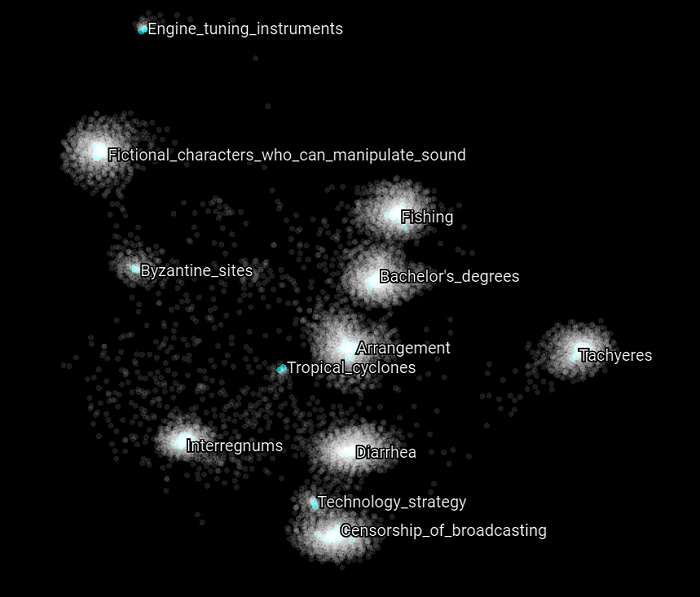 The resulting linked structure composes the graph used by the DeepWalk algorithm to generate the embedding vectors for each of the Wikipedia categories. Next we generate the final Deeplearning4j graph used by the DeepWalk algorithm to generate the Wikipedia categories graph embeddings. Once the DeepWalk object is created and initialized with the graph, the next step is to train that model to generate the embedding vectors for each vertice in the graph. Now that the DeepWalk algorithm has been created and trained, we then create the training sets for the SVM classification model. The training set is created from the manually vetted linkages between the KBpedia knowledge graph and the Wikipedia category structure. 75% of the vetted linkages is used for training and 25% for cross validation. This sampling is performed randomly. candidate based on its graph embedding vector." The training set is composed of 7,124 items and the validation set is composed of 2,375. There are 7,646 positive training examples and 1,853 negative ones. Now that the training and the validation sets have been generated, the next step is to train the SVM classifier using the training set. The initial evaluation of our model uses the following hyperparameter values. Also, the SVM implementation we use is LIBSVM implemented in Java. We use the RBF kernel. This algorithm simply iterates over all of the possible combinations of hyperparameter values as specified in the input grid parameters. Let's run the grid search to find the best values for each of the hyperparameters of the SVM classifier that uses a RBF kernel while optimizing the result of the F1 score. Finally, we create the final optimized SVM model that uses these optimal hyperparameters. What we want want to do next is to visualize the apparent relationship between each of the positive and negative training examples based on their latent representation vectors as computed by the DeepWalk algorithm. We visualize the training set using two different methods: Principal Component Analysis (PCA) and t-distributed Stochastic Neighbor Embedding (t-SNE). The goal of trying to visualize the graph using these techniques is to try to find insights into the models we created and see if our intuition holds. The tool we use to create these visualizations is the TensorFlow Projector web application. 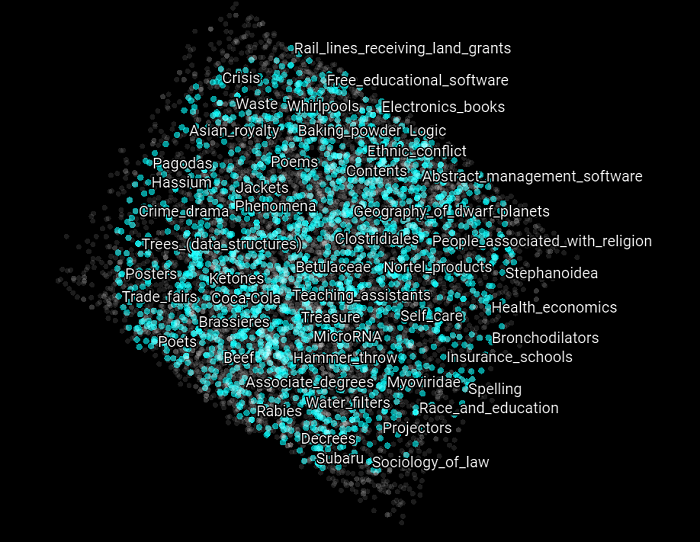 This visualization tool requires two input CSV files: one that lists all the vertices of the graph with their embedding vectors, and one that lists all metadata (name, class, etc.) of each of these vertices. PCA can be viewed as an unsupervised learning algorithm that learns the representation of data through patterns in the data, so as to detect correlations between variables. Before starting to look into these visualization and get insights from them, let's review how they get created in the first place. n/a - which means that the node belongs to the training set. Note that only the validation set is classified by the SVM. 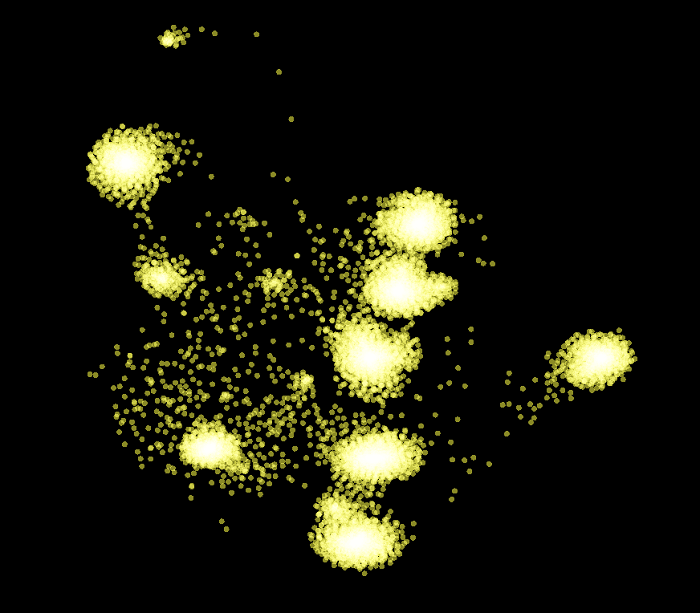 The SVM classification of each of these nodes is unrelated to the way the PCA or the t-SNE algorithm works. However we want to see if there are some correlations between the two by checking the positioning of the nodes given how the SVM classified them. All of the scatter plots below have been generated using the TensorFlow's Projector application. For each of them, we also document the vectors, metadata and files that enable independent visualization and exploration of these graphs. To load this scatter plot, download this package, follow the instructions shown under http://projector.tensorflow.org/, then load the vectors and metadata files. Finally load the bookmark using the txt file from the package. In the following scatter plot, we can see all the 9,499 examples of the training and validation sets as visualized by the PCA algorithm. Now we only highlight the negative examples of the validation set. What we can observe in this graph is that all of the examples that have been classified by the SVM model we created above have been displayed at the edges of the PCA plot. Then if we highlight the positive examples of the validation set, we can observe that all the examples that have been classified by the SVM model have been arranged at the center of the PCA plot. This material shows the structure that emerges from the creation of the graph embedding, how it is classified using the training set, and how it is classified by the SVM classifier and arranged by the PCA algorithm. 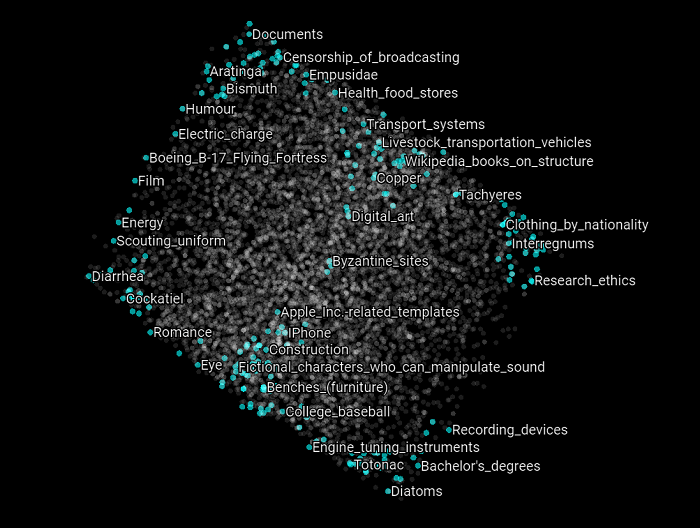 Let's investigate further with the t-SNE algorithm. t-SNE is another unsupervised learning algorithm that tries to learn the representation of the data to get insights about it. In the following graphs, we see a few 3-dimensional scatter plots to see what they look like, but we focus on the 2-dimensional renderings of the same plots since they are easier to visualize and interpret. We encourage you to load the graphs in the TensorFlow Projector to play with and manipulate the 3-dimensional expressions of the plot. 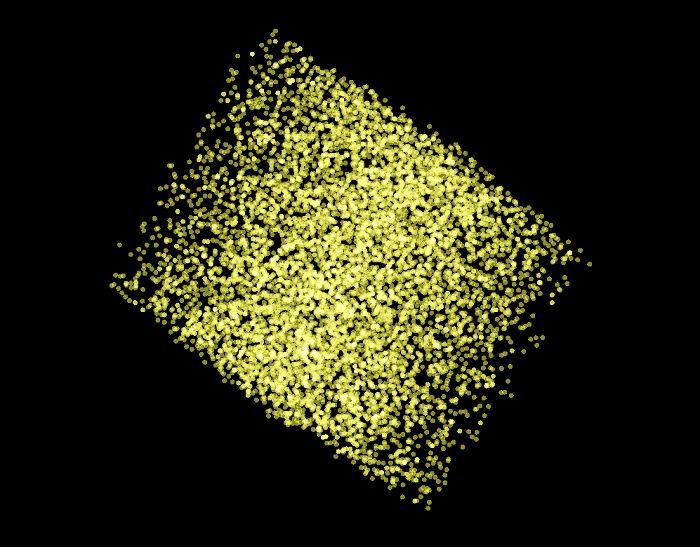 The following 3D scatter plot shows all the 9,499 examples from the training and the validation sets as rendered by the t-SNE algorithm. This graph used a perplexity of 25, a learning rate of 10 and we ran the algorithm for 8,500 iterations. Remember that the graph embedding vectors of these examples have three features, which means that they are represented in three dimensions. However, when we will visualize the same t-SNE graphs in two dimensions, the dimension will be reduced by one by the algorithm. What we can observe is that a few big clusters emerge. Theoretically, the features learned by the DeepWalk algorithm represent the inner structure of the graph surrounding the vertices (concepts). With the current graph we created, we have the full KBpedia knowledge graph structure linked to the full Wikipedia category structure. These clusters represent concepts that have a similar graph structure when we the DeepWalk algorithm randomly walk each vertex following the sub-class-of directed edges of the graph up to depth of 15. Intuitively we assume that these clusters are created because they are following a similar conceptual parental chain up to shared SuperTypes. Now let's highlight the negative examples of the validation set. What we can observe in this graph is that all the examples that have been classified by the SVM model we created above have been displayed at the center of each cluster created by the t-SNE algorithm. When highlighting the positive examples of the validation set, we can see that almost all of the vertices belong to the clusters, but also apparently at the outer edges of the clusters. Now let's reduce the number of dimensions to two dimensions to have an overall easier scatter plot to visualize. Here are all the training and validation set examples. Here we only focus on the negative examples of the validation set. We can clearly see that each of the negative examples appears at the center of each cluster. Here we only focus on the positive examples of the validation set. Now let's focus on specific Wikipedia categories that can belong to the training or the validation set. 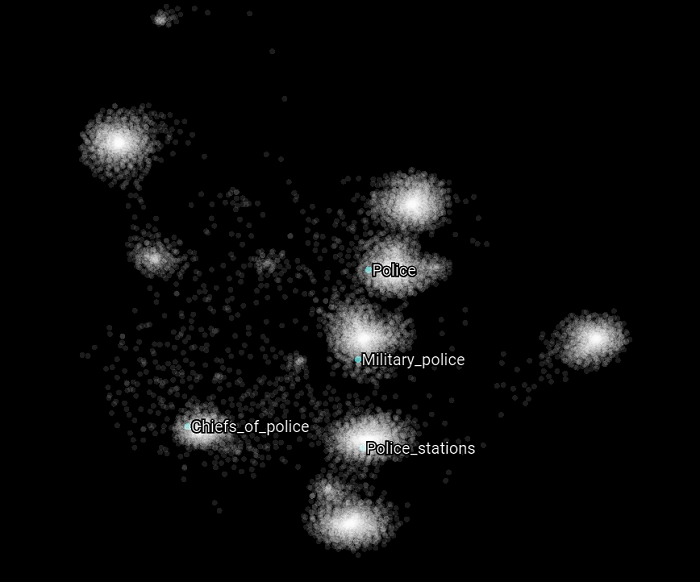 In the following scatter plot, we highlight all the categories that have the word "police" in them. 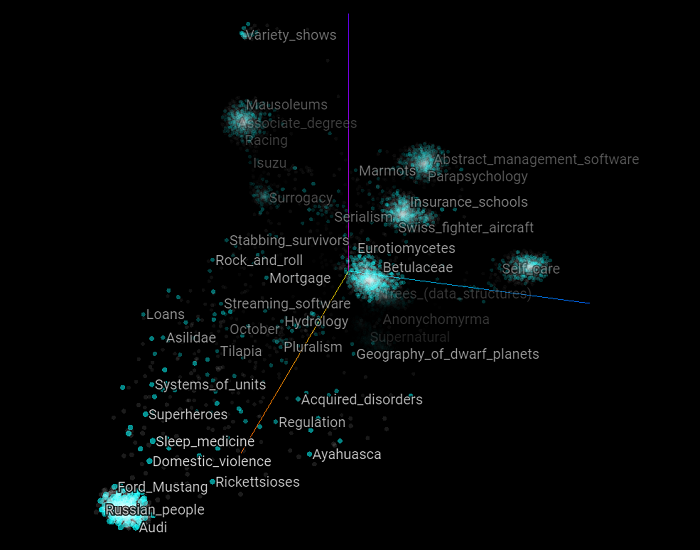 What we can observe is that each of these categories related to the general topic police belong to different clusters. But at the same time, they refer to different kinds of concepts related to the police topic. What this suggests and may validate is that the intuition we had about the nature of these clusters is that they are related to some SuperType and that they are clustered as such. Let's see if this holds with other kind of topics as well. 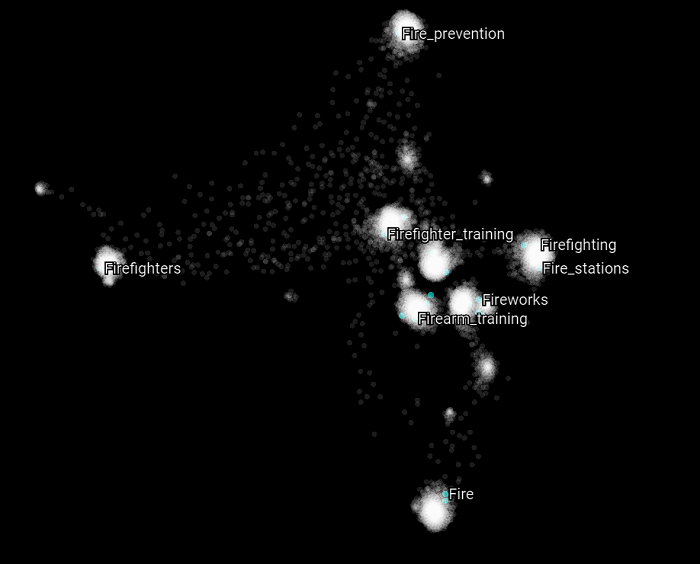 Here we highlight all the Wikipedia categories that have the word "fire" in them. The same appears to be happening again. 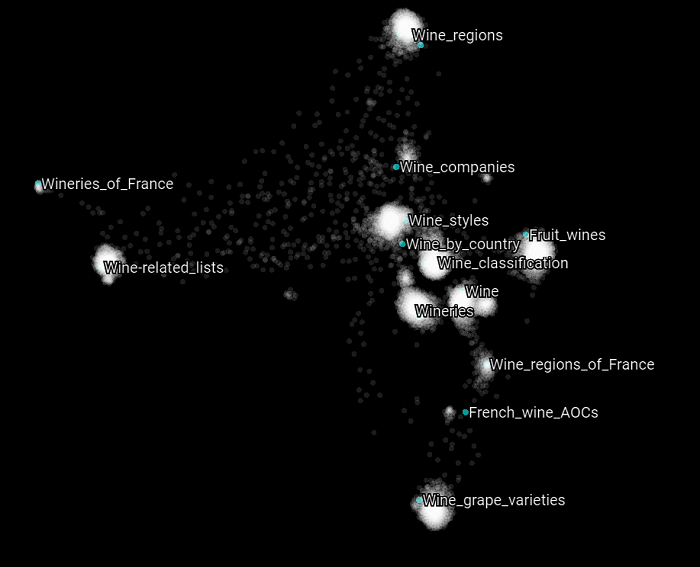 Most of the concepts belongs to distinct clusters and appear to be related to different upper structure concepts. 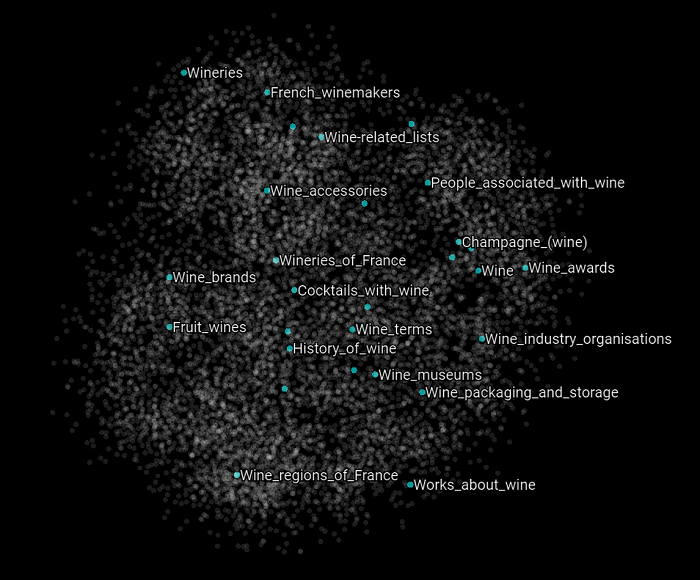 As another example, here we highlight all the Wikipedia categories that have the word "wine" in them. 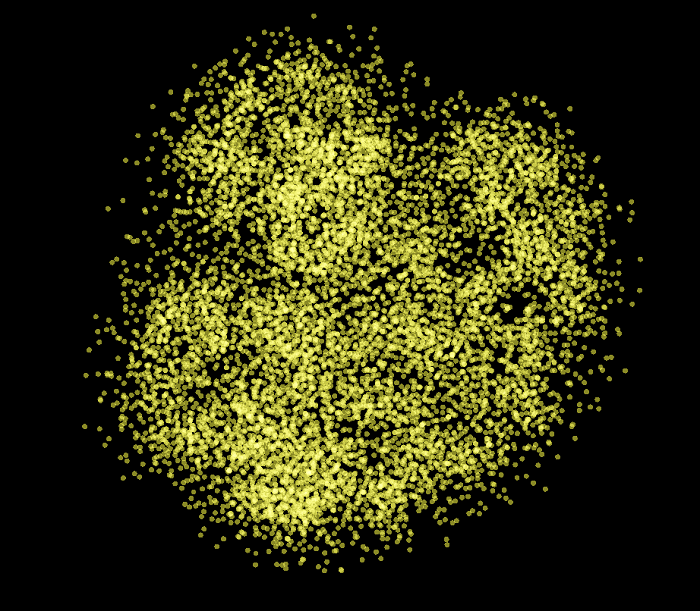 The depth of the random walks (walks-per-vertex). The first experiment we want to perform is to visualize how the DeepWalk algorithm reacts if we change the depth of the random walks from 15 steps to only five. The first thing we have to do is to create the deep-walk object with a window-size of 15 and a vector-size of three. Nothing else changes here in this experiment. Then when we train the model, we want the algorithm to go five steps for each vertex in the graph instead of 15. Then we create the create a new set of training and validation sets to evaluate the model. We create a new SVM classification model trained on the new graph embedding vectors that have been created by DeepWalk with a walk-length of 20. Finally we evaluate the new model. Note that we used the optimal SVM hyperparameter values that we found with the grid search above. The results are somewhat equivalent with the previous ones we experienced. 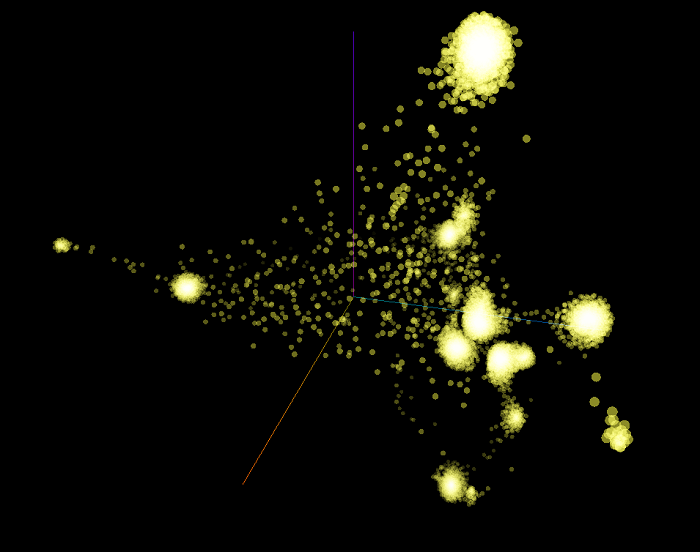 However what we want to do is to visualize the new scatter plot generated by this new DeepWalk model. The following models have been created using DeepWalk with a walk-length of five, 175 iterations and embedding vectors with three dimensions. The visualization has been created using the t-SNE algorithm with a perplexity of 25, a learning rate of 10 and 8500 iterations. To load the following scatter plots, download this package, follow the instructions at http://projector.tensorflow.org/, then load the vectors and metadata files. Finally load the bookmark using the txt file from the package. 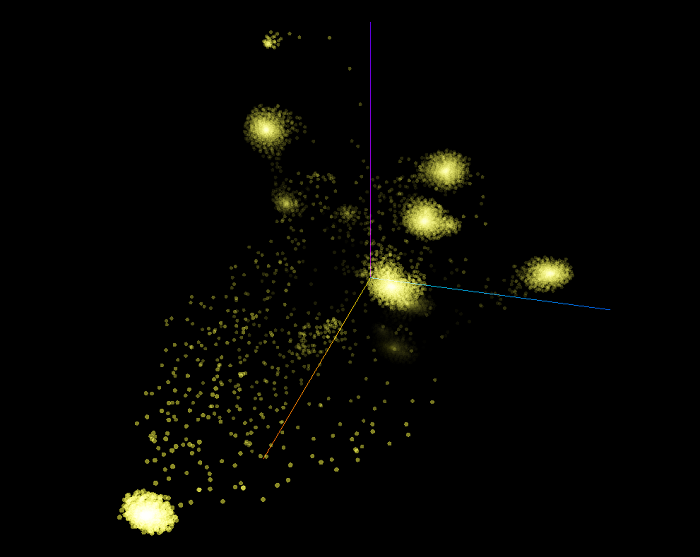 Here is the 3-dimensional rendering of the scatter plot. 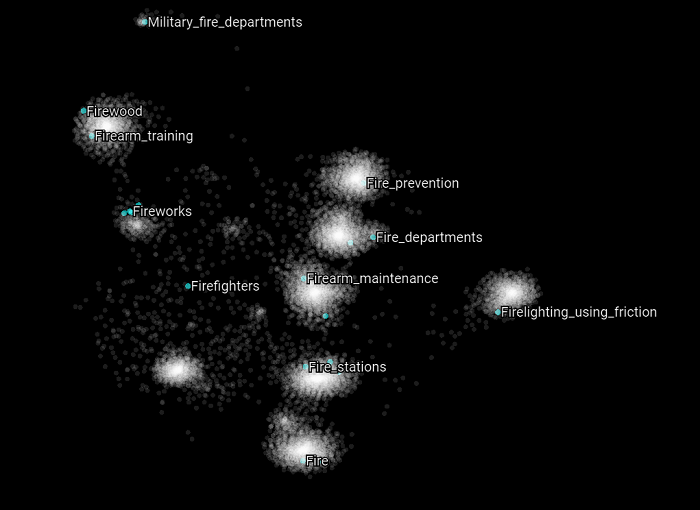 Here is the 2-dimensional rendering of the same graph composed of all the examples of the training and validation sets. If we compare this plot with the one that had a walk-length of 15 (see above), we can observe that most of the clusters are much closer to the other, which suggests that their distinctiveness is less pronounced than it was with a walk-length of 15. This intuitively makes sense since we only walk five vertices of the graph instead of 15, then the upper structure of the knowledge graph has less impact on the overall structure (as exemplified by the graph embeddings) of each vertex. Here we only focus on the negative examples of the validation set. We can see that each of the negative examples appears at the center of each cluster. Now let's focus on specific Wikipedia categories that can belong to the training or the validation set. 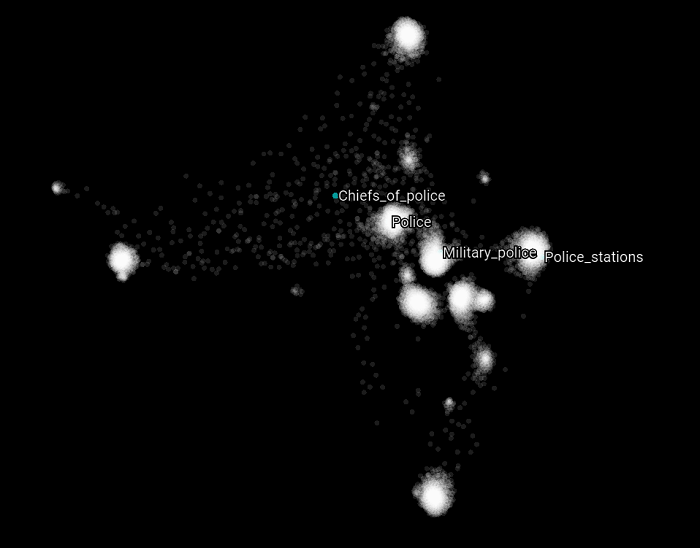 In the following scatter plot, we highlight all the categories that have the word "police" in them. 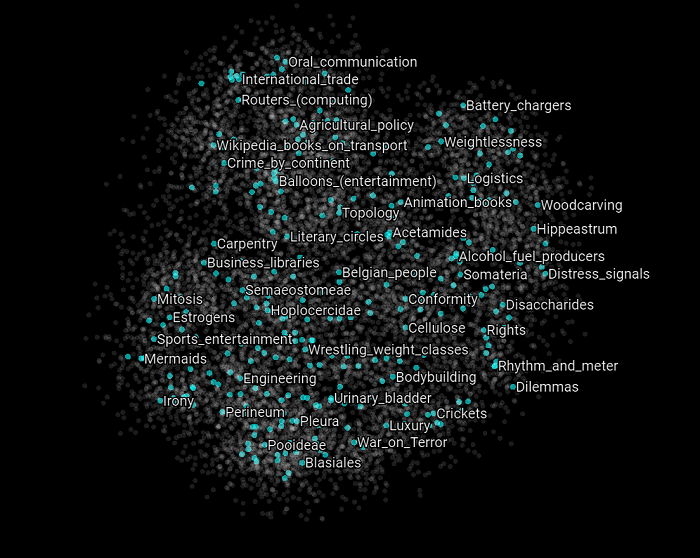 What we can observe here compared to the previous version of this graph is that these Wikipedia categories appear closer to each other which suggest that the upper structure has less impact on how the over all categories are clustered (by their graph latent structure). Also, the Chiefs_of_police does not belong to any cluster, but it was when we used a walk-length of 15. The same behavior can be observed for the categories that have "fire" in their name. Finally exactly the same behavior can be observed for the categories that have "wine" in their name. 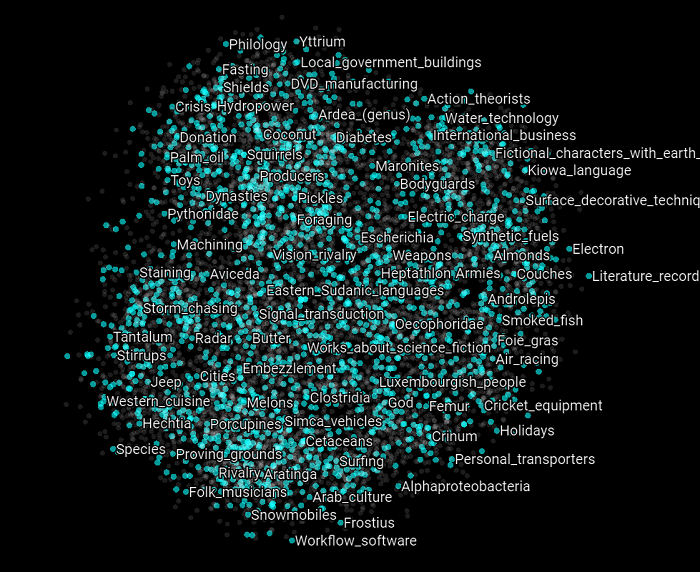 What we can conclude from changing the walk-length of the DeepWalk algorithm on this knowledge graph is that it appears that it will have an impact on how the vertices will be represented and clustered by the t-SNE algorithm and how each other will be related one between the other considering their graph embeddings. A higher number for walk-length appears to be more beneficial, but takes more time to compute. Now let's experiment when we increase the number of dimensions for the graph embeddings. Let's increase the number of dimensions from three to nine. However let's use the walk-length of 15. The first thing we have to do is to create the DeepWalk object with a :vector-size of nine. Then we train the model with a walk-length of 15 and and 175 iterations. We re-create the training and validation sets to train the SVM classifier. Then we re-run the grid search to find the optimal hyperparameters to properly configure the SVM classifier with these new graph embedding vectors as computed by the new DeepWalk model. OK, so let us now visualize this new model that uses nine dimensions instead of three. The following models have been created using DeepWalk with a walk-length of 15, 175 iterations and embedding vectors with nine dimensions. The visualization has been created using the t-SNE algorithm with a perplexity of 25, a learning rate of 10 and 30,000 iterations. Now let's visualize the graph of all the training and validation set examples reduced from nine dimensions to two. As you can see, this graph is quite different from the previous ones. We can see some kind of blurred clusters but everything is quite scattered. The following graph highlight all the positive examples of the validation set. Here are all the categories that belong to the negative examples of the validation set. There is no apparent structure for these two graphs; vertices just appear to be "randomly" displayed in the scatter plot. 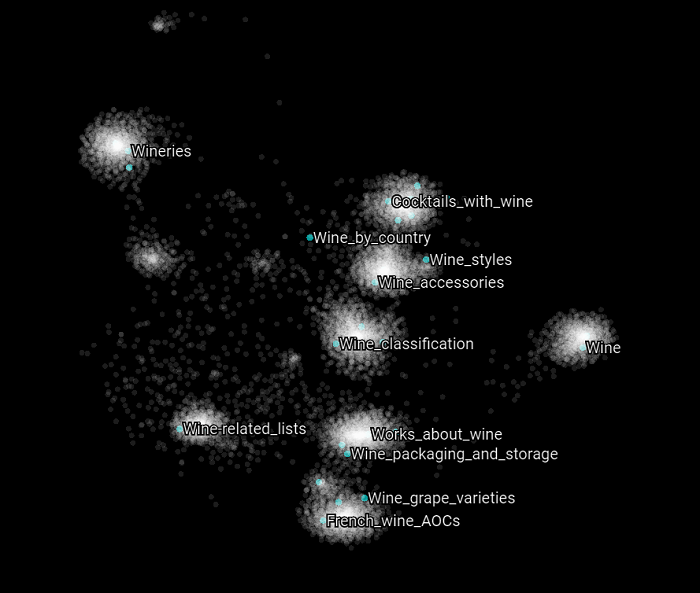 Finally let's highlight the Wikipedia categories that have the word "wine" in them. What this experiment shows is how care should be taken when visualizing, and more importantly interpreting, these kinds of visualizations created by dimension reduction techniques such as PCA and t-SNE algorithms. Now that we have an adequate model in place, the last step of the process is to classify each of the candidates we previously found using our best optimized model. Remember that the goal is to find Wikipedia category candidates that can be placed within the existing KBpedia reference concept (knowledge) graph by either extending the graph or filling gaps within it. So, what we have to do is to iterate over all the candidates we found and to classify each of them according to their graph embedding vectors as classified by a SVM model configured using the best hyperparameters. The result of this classification task is that among all the candidates we identified, 20,653 have been classified to be possible new KBpedia reference concepts, a potential expansion of our starting knowledge graph of about 50%. These final candidates will then be reviewed by a KBpedia maintainer to make the final decision to determine if that concept should be added to KBpedia or not. What we demonstrated in this use case is how the inner structure of the KBpedia knowledge graph and its linkage to external conceptual structures such as the Wikipedia category structure can be leveraged to extend the scope of the knowledge graph. Additionally we demonstrated how machine learning techniques such as DeepWalk and SVM classifiers can be used to filter potential candidates automatically to reduce greatly the time a human reviewer has to spend to make a final decision as to which new concepts will make it into the knowledge graph. While the example herein is based on the Wikipedia category structure, any external schema or ontology may be handled in a similar way. A multitude of machine learning techniques are available at each step in the evaluation. The essential point is to create a system and workflow that enables huge numbers of combinatorial candidates to be winnowed down into likely candidates for manual approval. The systematic approach to the pipeline and the use of positive and negative training sets means that tuning the approach can be fully automated and rapidly vetted. Many of these machine learning techniques are relatively new within the scientific literature. Applying them to these kinds of tasks is novel to our knowledge. But more importantly, based on our experience performing these tasks, the time spent by a human to extend such a big coherent and consistent knowledge graph can significantly be reduced by leveraging such techniques, which ultimately greatly reduces the development and maintenance costs of such knowledge graphs. 1 Perozzi, B., Al-Rfou, R., & Skiena, S. (2014, August). Deepwalk: Online learning of social representations. In Proceedings of the 20th ACM SIGKDD international conference on Knowledge discovery and data mining (pp. 701-710). ACM. 2 Goodfellow, I., Bengio, Y. & Courville, A. (2016). Deep learning. Cambridge, MA: MIT Press.